Giorgio Morandi was a reclusive man who specialised in painting still life pictures, called in Italian 'natura morta'. He lived and worked in an apartment in Bologna which he shared with his sisters, in relative isolation from the current art movements. Here he devoted himself to the contemplation of familiar, everyday objects that he had collected over many years, arranging and depicting them with great subtlety. Although they are mostly intimate in scale, Morandi's paintings are strangely grand in feeling. Perhaps this is because his unremarkable, dusty bottles, bowls and vases have been combined and spaced so carefully that they reverberate with an uncanny tension. The pale, often greyish surfaces of inanimate objects in his works acquire a tremulous physicality. Brushing in dry, matte pigments with a sensitively varied touch, Morandi lends an organic quality to the wobbly geometry of the compositions. His still life objects seem bathed in a pearly atmosphere. The opaque surfaces are thoroughly enigmatic, but evoke cloudy skies or times of the day, nuanced moods and qualities of stillness or immensity, all within the confines of a tabletop. 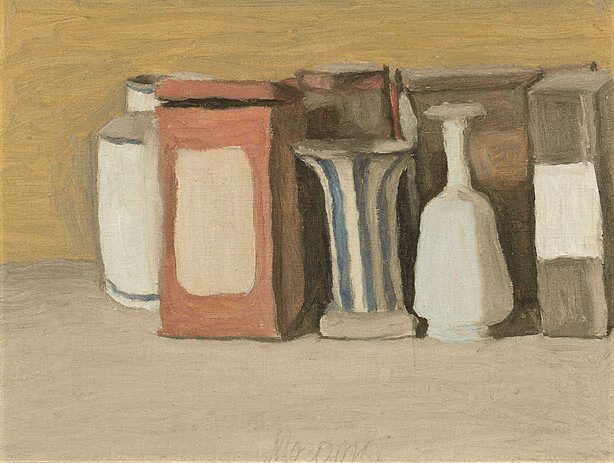 In the end, Morandi's silent art becomes a form of meditation. Signed l.c., grey oil "Morandi". Not dated. Edmund Capon, Look , 'Morandi's visual poetry', pg.11, Sydney, Jun 2005, 11 (colour illus.). Morandi: catalogo generale , Milan, 1983, (illus. ).